Here’s the link to the Aluratek Libre Color review. A big thanks to Christopher Carvalho for writing the review and for shooting a detailed video walkthrough. 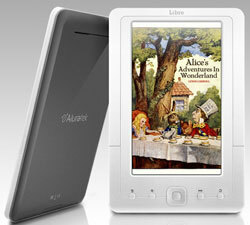 The Libre Color is a relatively new ereader from Aluratek. It first started selling a couple months ago in very narrow markets and is just now starting to become more widely available online. It still hasn’t made a push into major retail stores just yet, but given the widespread retail presence of Aluratek’s Libre Pro, the Libre Color should start showing up in a lot more places in the coming months. Check the review for the full rundown of the Libre Color. I REGULARLY CRUISE THE QVC CHANNEL. I HAPPENED ON TO IT WHEN THE ALTUREC 7 INCH COLOR CAME UP FOR SALE. I LIKED THE DEMONSTRATION SO WELL I PURCHASED IT. AM HAVING FUN WITH IT. I LOVE THE COLOR SCREEN WHICH THE NOOK DOESN’T HAVE. AND IT’S SO MUCH EASIER TO WORK THAN THE NOOK. I HIGHLY RECOMEND THE ALTUREC TO ANY ONE EVEN MY GRANDMOTHER.